A list of doctors/facilities that treated you, and the expenses incurred for each. 5. Medical bills & out of pocket expenses, such as receipts for prescriptions, braces, or over the counter medication. Those expenses are in addition to the cost of physical therapy, EMS charges; dentist and oral surgeon costs, neck collars, wheelchairs, and the like. Besides medical expenses, these accidents can involve substantial time off from work to recover from broken bones, like an ankle, and can result in a permanent injury such as a herniated disc. Which is why, a victim of a slip and fall at a supermarket or restaurant will likely need to pursue a personal injury claim because how else can he or she recover their expenses, including their lost income. So, how does a victim pursue a claim? A victim may do so by submitting a demand letter detailing their claim and asking for a sum of damages that will make them whole again. A demand letter is a letter sent by the injured party to the insurance company that represents the negligent party. 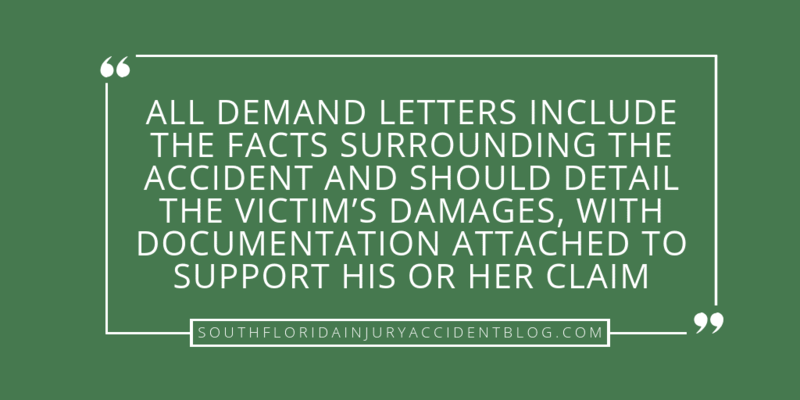 All of the demand letters we prepare include the facts surrounding the accident and should detail the victim’s damages, with documentation attached to support his or her claim. Essentially, a demand letter gives a narrative of the facts of the slip and fall, and it explains why the store or other business establishment, restaurant, etc., is responsible to compensate the victim. A demand letter should also include an exact dollar amount that the victim is asking for as compensation for their damages. As noted above, the amount demanded should be supported by documentary evidence (see below). There is no law that requires a slip and fall victim to hire a personal injury lawyer to prepare their slip and fall demand letter. The accident victim is free to write their own demand letter and present it to the insurance company for its consideration in settling the matter. Written statements by one or more witnesses to the slip and fall or trip and fall accident are helpful to support a claim. Here, those who saw what happened provide their story of the events before, during, and after the incident occurred. A victim should gather the name, address, and contact information of any witnesses of the slip and fall. Family and friends who were present at the time of the accident can provide testimony, however, strangers who saw the accident may be stronger witnesses since they are uninterested third parties. An insurance adjuster will have a harder time arguing that their recollection is biased in the victim’s favor, as opposed to bystanders who know the victim. For a victim of a slip and fall, it may be wise to request that a police officer arrive to the scene and write a police report. A police report will specify the exact time and date that the incident occurred, provide details of the accident, and gather the contact information of any witnesses who may have been present. This may be a good idea especially if the business establishment does not create its own incident report. Read: Do I Still Have An Injury Claim If I Didn’t File A Timely Police Report? Photographs at the time of the accident are one of the strongest forms of evidence. If possible, photos should be taken immediately following the accident. This is because the store or restaurant will clean up the spill or what caused your accident, and a slip and fall victim must provide proof that the dangerous condition(s) were present. A hospital stay after a slip and fall accident can include a variety of medical expenses that should be stated in a demand letter. All documentation from the hospital can and should be provided as attachments. This includes expenses for any medications, emergency room treatment, surgery, post-op, physical therapy, etc. This information should be detailed in the hospital invoice that the victim receives at or after discharge. The treating physician will have his or her own doctor’s report or “narrative” for the victim’s injuries and treatment. There will be a prognosis, for instance, of the victim’s long term recovery from the fall, as well as the medical explanation of the injuries and what was done to treat the victim. Other doctors may have narratives to provide, as well. If the victim needed specialists as part of their care (e.g., an oral surgeon) then their reports need to be included with the settlement demand letter. Additionally, Emergency Medical Technicians create written medical reports of what happened during their treatment at the scene and during transport to the care facility, just like nurses and doctors do in the hospital. Copies of their reports of a victim’s EMS care are important to include with the demand letter. Details may be revealed here about the scene of the accident, the amount of pain and suffering the victim was experiencing, and other facts that prove a settlement demand in ways that other documentation cannot. If a victim missed or lost work because they were hurt in an accident, Florida law provides that they be compensated for their “lost wages” — but the victim needs to be able to prove these losses. A demand letter which includes a claim for lost wages needs to have documentation from the victim’s employer that gives the details on days missed, the amount of wages the victim was docked, and any other losses they have incurred from being off the job. These documents need to be signed by a representative of the company, and it’s helpful if it is printed on the company’s letterhead. Sometimes, lost wage claims are difficult to pursue because the victim is paid in cash or off the books, or isn’t working at the time of the accident. Read: Can You Have an Injury Claim for Lost Earning Capacity When You Don’t Have a Job? The victim should also use the phrase “for settlement purposes only” to make sure it’s understood that this is an offer in settlement. It is also important to describe the aftermath of the accident to the victim and his or her family members and any resulting emotional distress the victim may have experienced (anxiety, depression, etc.). Also, one should be prepared to negotiate with the adjuster. This demand letter is an invitation for settlement negotiations.